Trnava is an administrative, economic, cultural and science-research centre in Western Slovakia. It is one of the oldest and most beautiful mediaeval towns in Slovakia. Nowadays Trnava belongs to the most rapidly developing cities in Slovakia with strong industrial investments (e.g. Peugeot-Citroën, Samsung, Johns Manville). Urban growth causes strong environmental problems in the area - air and water pollution, agricultural land take and low ecological stability of landscapes. The adjacent area to the city of Trnava represents intensively managed large-scale farmland. The study area consists of the city and its buffer area (16 settlements, 324.8 km2, 92,730 inhabitants). Develop and test usable methods for valuation selected ecosystem services at the local and regional level, and promote their incorporation into the spatial planning process and in the broader decision making process in Slovakia. Positive feedback from the potential users of new methods. Results and proposed actions should be implemented by local authorities, regional authority, partly also by Ministry of Environment. Assessment of the ecosystem services framework implementation in Slovakia. 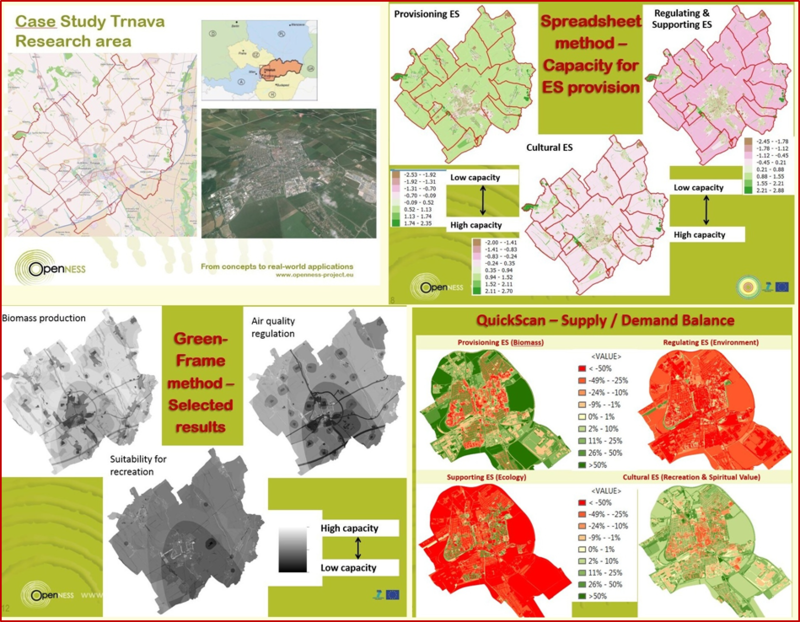 Integrated valuation of ecosystem services as a tool for landscape management and decision making at regional and local level (Case study Trnava, Slovakia). Ecosystem services framework implementation in the context of urban planning and environmental impact assessment in Slovakia.